THE WRITING BUDDHA - Opinions | Books | Movies: Arise, Awake by Rashmi Bansal (Book Review- 4.75*/5) !!! 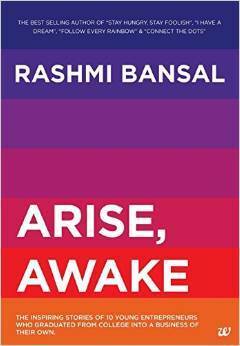 Arise, Awake by Rashmi Bansal (Book Review- 4.75*/5) !!! Few authors are such that even when you have not read any of their work, they are your favorites just because you hear so much about their amazing work that you start liking and recommending them. Somewhat similar kind of scene I have with authoress, Rashmi Bansal. She was actually the first writer I met personally at the launch of her 2nd book, Connect the Dots. After that, I have met her 4 times in various events. I have read 3 of her books but had to leave them in between because of some urgent work co-incidentally each time. But the kind of affect those real stories of entrepreneurship made on me has been very impact-ful. Finally, I have read and completed reading her latest book – Arise, Awake. Arise, Awake comes with the tagline- “The Inspiring stories of 10 young entrepreneurs who graduated from college into a business of their own”. The book consist of 10 stories in which students got an idea while studying of starting some unique business and they didn’t wait but started building blocks by blocks and finally became successful as an entrepreneur. They not only touched 6 digits profit but even 7 and 8 digits in some cases. Each story is unique and the examples searched by the authoress to be featured in the book are incredible. Except one story, almost every story hit me and made me realize that there are certain things I do with very less amount of money or for almost free out of which I can create some small business and later on turn it into a big one like all these gutsy heroes. If the book has made this thought enter in the mind of its reader, it has become successful in its idea. And all the credit goes to the author for this. The way Rashmi Bansal describes these people and their stories is really very amazing. You will feel as if you are having conversation with the real people in live. After completing the book, you will feel as if you were in a conference where all these people have spoken just in front of you. In the books based on the similar idea, often author do not discuss that real angle which brought profit to the proprietor or businessman but it’s incredible to see the chemistry between the author and these new entrepreneurs where we get to read that exact formula or approach with changed things for them. This is what makes Rashmi Bansal’s books the most popular in the genre and favourite of everyone who have an idea but are waiting because of lack of knowledge of how to proceed ahead. If you are in college and wanting to own a business rather than working for someone else, do purchase Arise, Awake. This book is waiting for you. I give this book project 4.75 stars out of 5.